The study looked at more than 20 years of records from Florida hospitals. Women are more likely to survive heart attacks if treated by women physicians in the emergency room, a new study that reviewed about half a million patients over more than 20 years found. The study confirms what years of research on "gender concordance" have shown -- that matching the gender of the doctor and patient can lead to better health outcomes. This review of records also confirms growing research that shows how heart attacks can be different for women -- and the way doctors assess and treat them can differ, too. Finding these differences are important because a large body of research shows that women are less likely to survive heart attacks, in general. Although women patients matched with women physicians have been studied before, this study is the first time heart attack outcomes were assessed for gender concordance. In this study, women heart attack patients were found to be more likely to survive if they were treated by women doctors, according to the team of researchers at Olin Business School at Washington University, Harvard Business School and Carlson School of Management at University of Minnesota Business School. After reviewing about half a million patients in the Florida Hospital database from 1990 to 2011, the researchers found that women treated in emergency departments were 5.4 percent more likely to survive heart attacks -- or acute myocardial infarction -- if the treating physician was also a woman. "This study is different than others because it documents, for the first time (to our knowledge), increased survival rates for female heart attack patients who are treated by female physicians," Dr. Seth Carnahan, author of the study and assistant professor of strategy at Olin Business School, said in a statement to ABC News. The study was restricted to cases in the emergency room, and for acute heart attacks. For the patients records reviewed, men also had better survival rates if the emergency room was staffed with more women physicians. 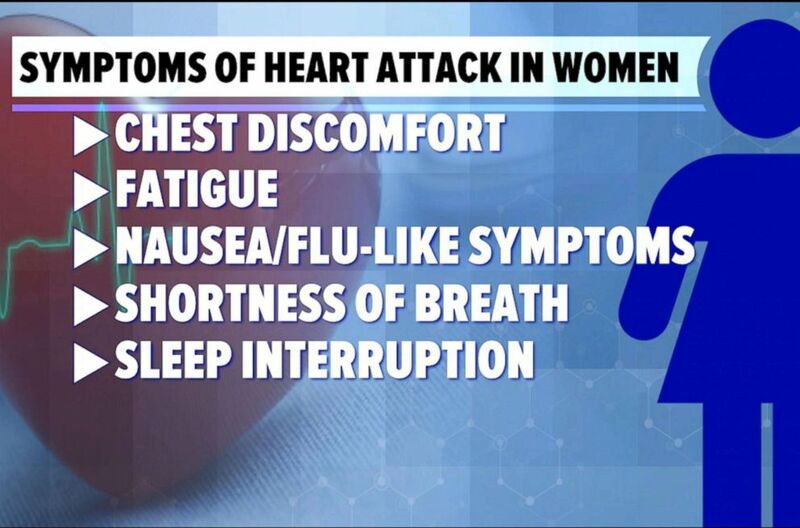 (ABC) A graphic lists symptoms of heart attacks in women. How are heart attacks in women different? Heart disease is the number one killer of women and men in the U.S., and symptoms of heart attack can show up differently in men and women. 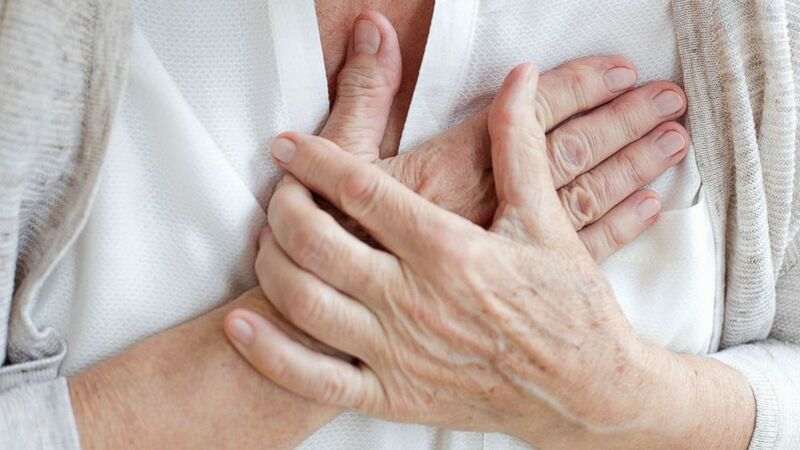 Women are more likely to have a "silent" heart attack or to display unusual symptoms. Their symptoms can be seem vague or similar to flu-like symptoms: Fatigue, mild chest discomfort, sleep disturbances and shortness of breath. Although a lot more research is needed, the results confirm how different women's symptoms can seem when they come into the emergency room for a heart attack. It is possible that doctors who are men may be less attuned to this and it could be that women physicians communicate differently with women patients. It's unclear what all the reasons may be for women patients surviving longer under the care of women doctors. Dr. Robert H. Shmerling, who is the author of the Harvard Health Publishing blog post "Does your doctor's gender matter?" wrote about a few more reasons. "Female physicians may follow clinical guidelines more often," he said in the post. "Female physicians may communicate better, with less medical jargon. Male physicians may be less 'deliberate' in addressing complicated patients’ problems (as suggested by past research)." Doctors of any gender want to save patient lives and improve care for everyone. "Especially in emergency medicine, where physicians are tasked with saving peoples’ lives, it is assumed that physicians should be working to save everyone’s lives equally," Laura Huang, professor at Harvard Business School and one of the study authors, told ABC News. (STOCK PHOTO/Getty Images) A senior woman holds her hands to her chest in an undated stock photo. Should women request physicians of the same gender? Although it is helpful to keep these findings in mind, no one should wait to be treated in an emergency situation -- especially with heart attacks where early treatment matters. There are many more questions to be answered after the results of this particular study: Would it matter if the patients were younger? Are outcomes similarly different for heart attack patients in the operating room instead of the emergency room? And many more. For both men and women, the same advice on preventing heart attacks applies -- and the Centers for Disease Control and Prevention said 80 percent of heart disease, especially heart attacks, can be avoided by modifying lifestyle behavior. ABC News' Bianca Seidman contributed to this report.